Watching: Beauty and the Beast. Okay, can we talk about how surprisingly amazing the live action Disney film is?! I'm not a mega Disney fan but Cinderella changed my cynical view of the live actions remakes (mostly because Cate Blanchett is a glorious queen). I thought I'd struggle to see beyond Harmione in Emma Watson but the second the songs started up I was reliving my youth and I just didn't care. It was pretty spectacular visually and Gaston is brilliant. I'm going again next week. Go see it, go see it, go see it. I also got my comedy quota in the form of Stewart Lee's latest stand up show and Rob Auten's Sleep Show, which is a curious mixture of spoken word and comedy about how we perceive and enjoy sleep. His delivery is a bit odd at times but I liked his surreal one liners and the unraveling of the narrative. Doing: I've been filling my month with very grown up activities, such as dinners and IKEA furniture shopping. Our friend Susan flew in last minute from Dubai and had a stopover at mine on arrival/departure. We succeeded in two separate day-long catch ups that didn't feel like catch ups. There are few people I can stay up until 4am with these days, just cackling about nothing significant over a mismatched accidental four course meal. She's definitely number one. Buying: hair and skincare products. It started with Wear Eponymous gifting me some gorgeous-smelling JKB Argent Millionaire Hair Mist at one of their fun twitter parties, and suddenly my wind-chapped skin just couldn't live up to the shine of my hair. I have been using AHA Liquid Gold for a while now, and I swear by it, but I've run out. I tried Nip+Fab Daily Cleansing Pads but saw no change so I thought I'd give the coveted Pixi Glow Tonic a go instead. It cleared up hormonal acne but my already sensitive skin has also flared up... I just can't win! Clicking: checking out awesome indies' stuff, of course. 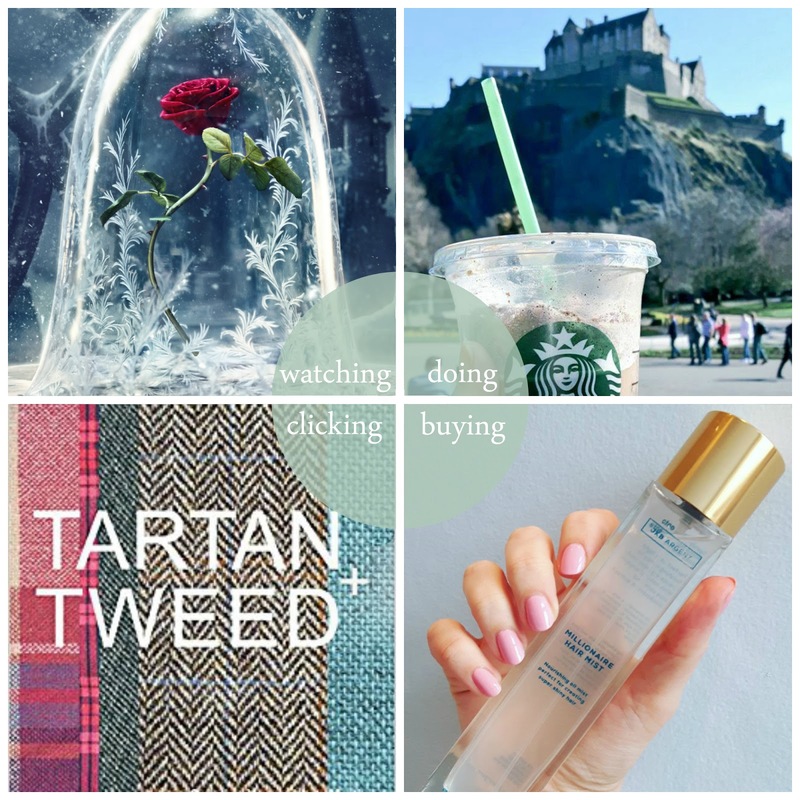 I've been keeping up-to-date with the news of fellow Scottish bloggers, Ann Martin and Caroline Young's forthcoming book, Tartan and Tweed, which explores the history and reinvention of these Scottish textiles. I'm hoping to pop along to the launch on Wednesday 5th April and pick up a copy. I've also been checking out the newly launched crowd funding project from fab Brighton designers-makers (and dino lovers), Designosaur YEAH, to help them build a studio with a laser printer. They have excellent rewards too, check them out! Watching: In March I had a period of about a week where I managed to fit in three trips to the cinema. Hidden Figures was a fun and uplifting film about a group of women working for NASA. I loved the light-hearted nature of it as well as the style; it was full of awesome hair, cars and glasses! Elle left me feeling a bit more conflicted. Telling the story of a what one women does after she is attacked in her own home, it has some questionable moments but does also have some interesting ideas, plus it featured a killer performance from Isabelle Huppert. The final film I caught was a small and strange indie movie called The Fits which is about a group of dancers who start suffering from unexplained fainting spells. It was odd and it doesn't exactly tie everything up but I really, really enjoyed it. Doing: Enjoying the sunshine! The last couple of weekends have been rather nice so I've spent a bit of time wandering around town and relaxing outside. I also had fun checking out some awesome women as part of the Dundee Women's Festival. I visited Wasps Open Studios where the lovely Jill Skulina taught me how to crochet and I got to take a look at Paola McClure and Alan Richardson's awesome exhibition: Edges of Transition. On top of all that, I made it along to the opening of Hayley Scanlan's new shop. Situated on the Perth Road, it's a bright and stylish little spot and features work by Kerrie Aldo and Emily Millichip alongside Hayley's awesome designs. 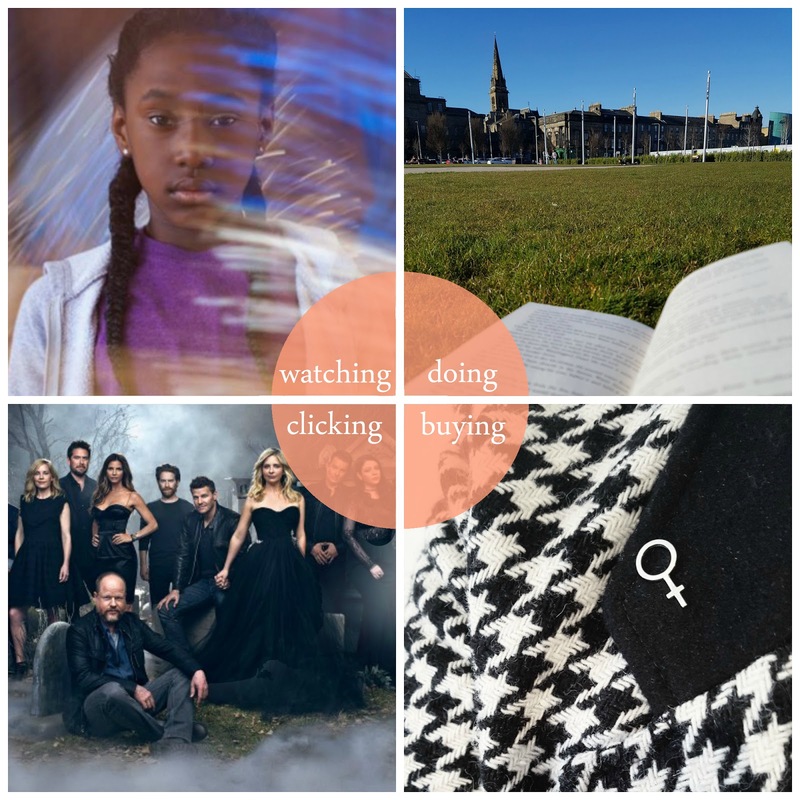 Buying: I treated myself to a Be Bold for Change pin from Kirsten Manzi. Designed for International Women's Day, 20% of each sale goes to Women's Aid. Getting an awesome piece of jewellery while giving to a good cause? Count me in! She still has a few left if you fancy one. I also bought myself a shiny new laptop which is allowing me to write this post. My old laptop was going SO SLOW! It would take an hour to load a web page! And the noise it was making, OMG! It constantly sounded like it was about to take off. My new one is super quick and super quiet. It's a 2 in 1 so I've been enjoying flipping it into tablet mode and watching a whole lot of Netflix. Clicking: With Buffy the Vampire Slayer turning 20 year's old (how did that happen, I feel so old! ), it's been fun seeing how the cast are looking now. I loved the show as I was growing up and re-watched it all just a couple of years ago. A killer leading lady, witty lines and an awesome gang of friends, what's not to love?! As well as the video of the reunion I've been reading a lot of other articles celebrating the show: this one by Anthony Stewart Head (aka Giles) was one of my favourites. I LOVE Designosaur but had completely missed the crowdfunding campaign, thanks for the heads-up! Loved Beauty and the Beast, hated Elle; still desperate to see Hidden Figures.